When you are taking a short break up to Scotland you can’t let the weather get the better of you! It seems like the theme of this short break was definitely water in its many geographical features. As it doesn’t say in the song – I’ll start at the end! 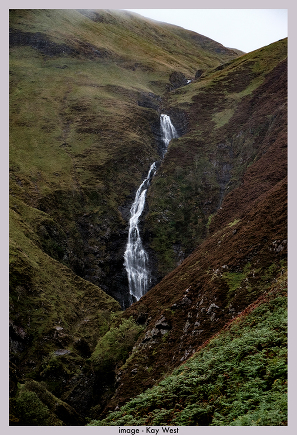 I’ve always liked waterfalls and found that I was staying very close to Grey Mare’s Tail waterfall near Moffat. So I had to visit. As it was raining and the tops of the hills were in clouds, I wasn’t sure how far I’d wanted to go on my own. I chose my Fuji XT1 with 18-55mm lens for its flexibility and packed it into a small Lowepro bag. (I seem to have a lot of different size bags depending on the number of cameras I take out and the lenses I want to use.) This day simplicity was key. I first went to the viewing place, then thought I’d just go up the hill to get a better view. On the way up the slope I met a man on his way down. 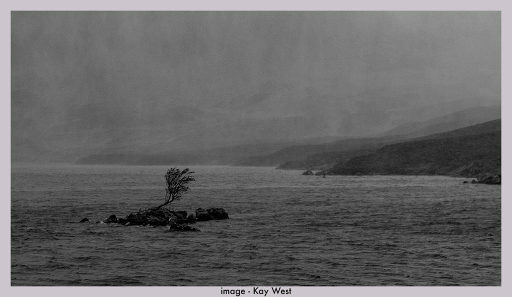 He asked if I was going all the way to the loch at the top, I replied I wasn’t sure because of the time and weather! He told me that it would only be a couple of hours there and back and that it was definitely worth the walk. 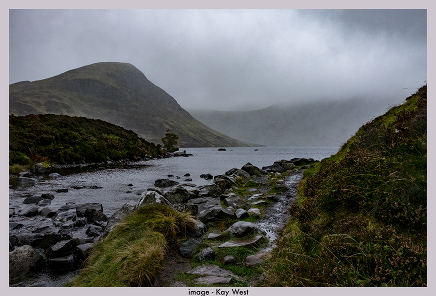 I wasn’t going to get much wetter due to the rain and I had enough layers on, I thought what the heck let’s go and see the loch. Cheerily said bye and headed off. After him I met only 2 other people on the way up, strangely enough they were coming down. The views down the valley came and went with the clouds, but the heather and water were spectacular. By the time I got to the top I was glad of all my layers, hat and buff. My walking shoes may be waterproof but not if the water runs in from the outside of my trousers. Gaiters maybe a good idea or waterproof trousers but I hate wearing a ‘bin bag’ coat let alone ‘bin bag’ trousers. I knew I would dry off later and I have a hot bath!! Turning round the corner at the top took my breath away! Loch Skeen was stunning, not as in the pictures on the information board but beautiful in its own way. I couldn’t see the hills surrounding it due to the clouds but that gave it the atmosphere. I stayed there a while getting blown and wetter, it didn’t matter, it was a brilliant place just to be. Reluctantly I knew I was going to have to go back down, but I hope to go back another time and enjoy that place again. Next time I’ll stay up there longer or perhaps go further up White Coomb and get to experience the promised breathtaking views. On reaching the car park I saw there were a few people enjoying the view of the waterfall from the bottom. I was so glad I was convinced by the other walker to brave the weather and go to the top.